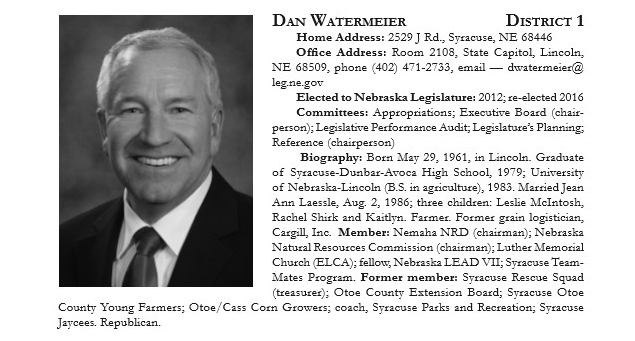 Dan Watermeier was elected to the Nebraska Public Service Commission (PSC) in November 2018 for a six-year term representing District 1, comprised of eight counties in Southeast Nebraska. Prior to joining the Commission, he served as a state senator in the Nebraska Unicameral from 2012-2018. A farmer by trade, Commissioner Watermeier received a Bachelor of Science degree in Agriculture from the University of Nebraska Lincoln. He is member of, the National Association of Regulatory Utility Commissioners (NARUC) Committee on Energy Resources and Environment, the Nemaha NRD (chairman); Nebraska Natural Resources Commission (chairman); Luther Memorial Church (ELCA); fellow, Nebraska LEAD VII; Syracuse TeamMates program. A detailed listing of Commissioners Watermeier's involvement can be found here. A resident of Otoe County, he and his wife Jean Ann, have three children.